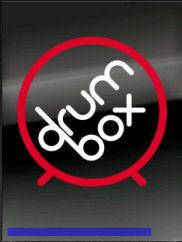 This section gives a quick overview of how to get started with the drum box. 1. The drum box is started for the first time. 2. The keypad keys are used to navigate the options screen: Up, Down and Fire. 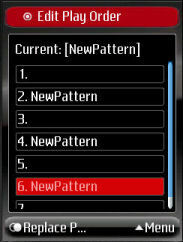 Pattern options is highlighted and fire pressed to select it. 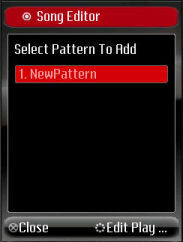 3 Press the fire button to "Edit Pattern"
4 Select the space to use for the new pattern. Here the top one (1.) 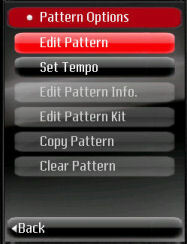 is selected, then the "Edit Pattern" menu option is selected using the right select key. 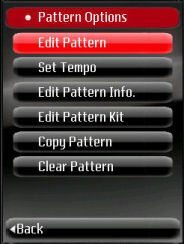 5 The default pattern name is used for now. Also the number of beats is left at 4 beats. 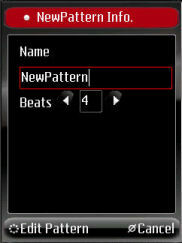 "Edit Pattern" menu option is selected using the left select key. 6. The pattern is edited using the keypad keys (Left, Right, Up, Down and fire). 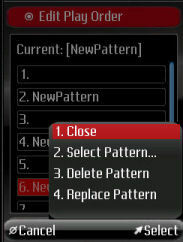 Once the pattern is complete, the "Close" menu option is selected. It is possible to select the display size from the "Menu", to make the grid large, medium or small. 7. 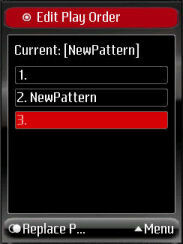 The pattern options is displayed, the "Back" menu option is selected. 8. 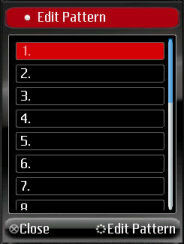 The down keypad key is pressed (highlight "Song Options") The fire key is pressed. 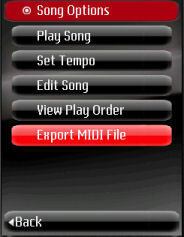 The Down key is pressed and fire pressed to select "Edit Song". 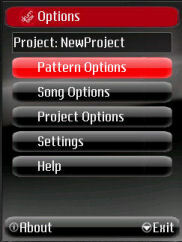 The pattern to add to the song is selected (currently there is only one), the "Edit Play Order" menu option is selected. 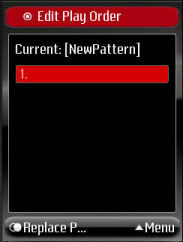 The down key is pressed and "Replace Pattern" is selected. 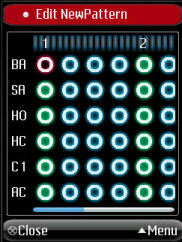 This operation is repeated several times to add the pattern several times to the song. 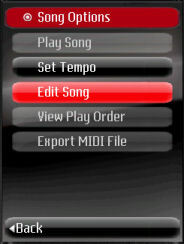 The "Menu" is selected, and "Close" selected from the popup to exit the song editor. 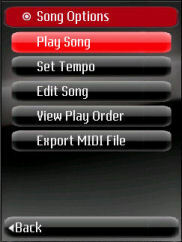 From the "Song Options", "Play Song" is selected. The play button is selected to play the song. Finally the "Close" menu option is selected to exit the player. 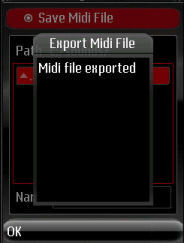 The keypad "Up" is pressed once, then fire to select the "Export MIDI File" option. 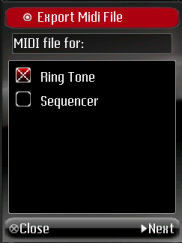 The default of "Ring Tone" file format is accepted by selected the "Next" menu option. The location of the file to save is selected using the Up/Down/Fire buttons. 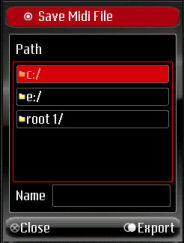 When the correct path is selected, the keypad Right button is pressed to edit the file name. 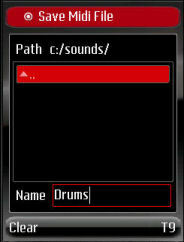 The file name "Drums" is entered, then the Down button is pressed. This changes the menu back so that "Export" can be selected. After exporting the file the following dialog is displayed. OK is selected. 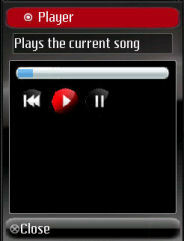 The "Song Options" is displayed, the "Back" menu option is selected. 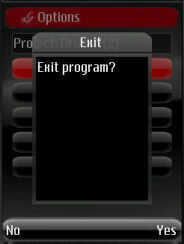 From the main "Options" screen, "Exit" is selected to exit the drum box application. The "Yes" option is selected to confirm that we wish to quit the application. 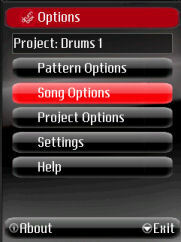 Manage patterns (edit, copy, edit, clear) and how to setup the drum kit for a pattern. Manage projects (load, save, save copy, delete). An overview of how the drum box application implements pattern based drum sequencing can be viewed here.